When The Joyful Horse Project received the nomination for Radiant Helping Hands April donation, U.S.Veterans and supporters of the Project’s Veterans Equine Therapy Services (VETS) Program answered the challenge. The VETS team is comprised of returning combat veterans and their family members who participate in a six-week program designed to forge connections and build bonds of trust with abused and neglected horses. Veteran coaches provide peer-to-peer camaraderie and assistance to other veteran participants — helping them gain the trust and respect of the horse. This group has an exceptional commitment to community and service — lending their time and talent to helping other veteran service organizations and local community groups. Collected over 140 pairs of new pajamas on behalf of Peaceful Dreams for local shelter kids. 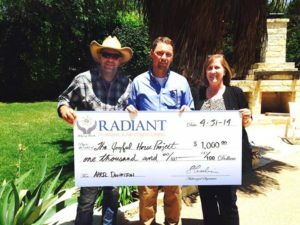 The April donation of $1,000 from Radiant Helping Hands will be used to sponsor one veteran family through the six-week VETS Program. This includes the cost of care for the horse, program facilitation and a community lunch each week. The benefits that these veteran families receive from the program reach beyond the joy of helping the horses become better suited for adoption. Working with the horse is often said to reduce the participant’s own stress, provide insight into other relationships and facilitate personal growth and healing. It’s a win-win for both the horses and veterans! To learn more about the Joyful Horse Project and the VETS Program visit their website: joyfulhorseproject.org. Honor veterans and the lives they touch. Give horses a second chance.